Halloween is less than two months away, and I for one am chomping away like a famished zombie for the brains of the spooky season. This year, in honor of the hit Netflix series Stranger Things, Universal Studios is offering up dishes inspired by the '80s phenomenon at both their Hollywood and Orlando locations. The menu was created by each park's executive chef and culinary teams to compliment the enthralling experience of this year's Halloween Horror Nights. Each park will also feature an entirely new maze for guests to experience the terror of the Upside Down inspired by the first season of the show. Behold, Universal's Stranger Things menu. If you're looking to try them, or experience the ghoulishness of Halloween Horror Nights, the event begins Friday September 14 at both parks. Inspired by the Upside Down dimension, this burger is loaded with spicy queso and crushed Flamin' Hot Cheetos on a potato roll. Guests can enjoy this hearty take on the dark realm with a side of tater tots. The show's season one villain, the Demogorgan, haunted our dreams well into the second season. 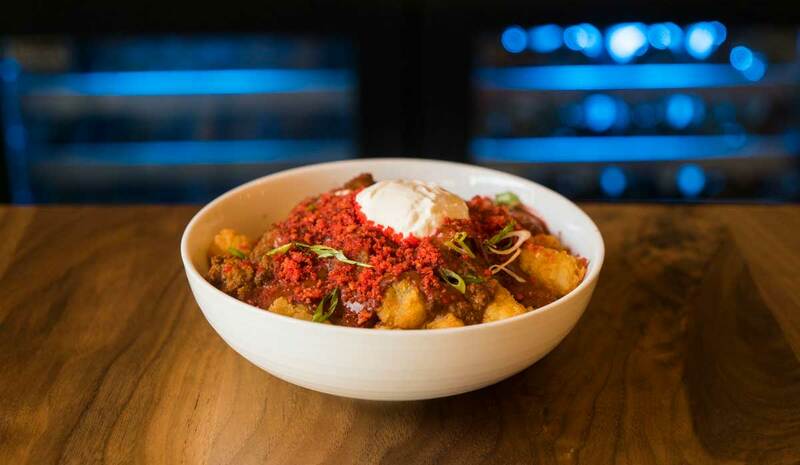 These inspired tater tot nachos, piled with spicy queso, chili, sour cream, and Flamin' Hot Cheetos, are worthy of anyone with a monstrous appetite. If there's one thing Eleven loves, it's Eggo Waffles. 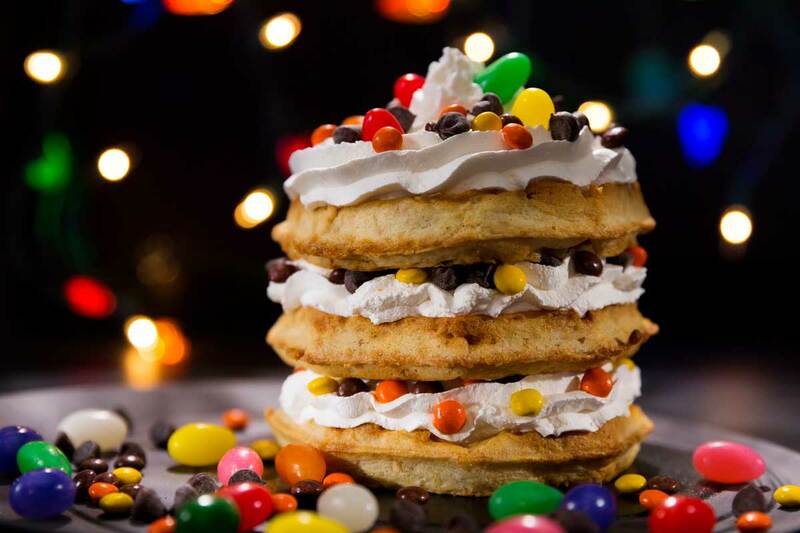 Eleven's Waffle Extravaganza stacks three Eggos with a layer of whipped cream and topped with candies like Reese's Pieces, jelly beans, and chocolate chips. A classic burger named after the gruff diner owner with a heart of gold, who takes Eleven in after she escapes Hawkins Lab. These juicy patties are served on potato rolls with a side of tater tots. 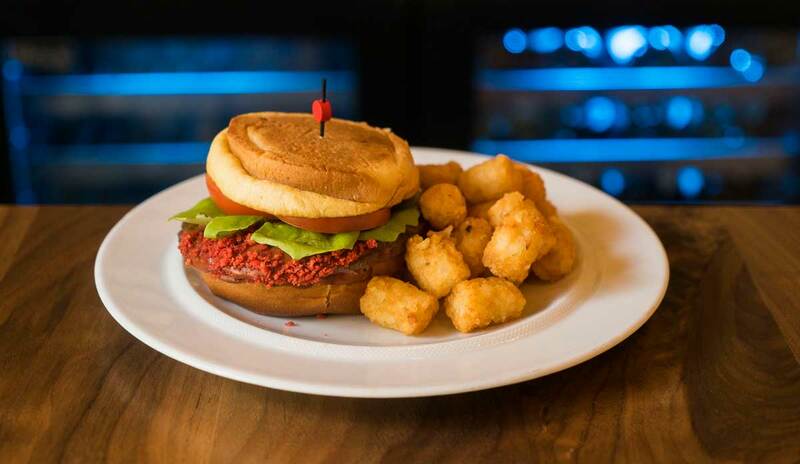 Another ode to the beloved Benny, this Chicken and Waffle Sandwich features grilled chicken served sweet and sour onions, sage-maple aioli, all between two Eggo Waffles. If I'm a sucker for anything, it's chicken and waffles. When you're being chased down by inter dimensional monsters, you don't really have much time to sit down to a meal. 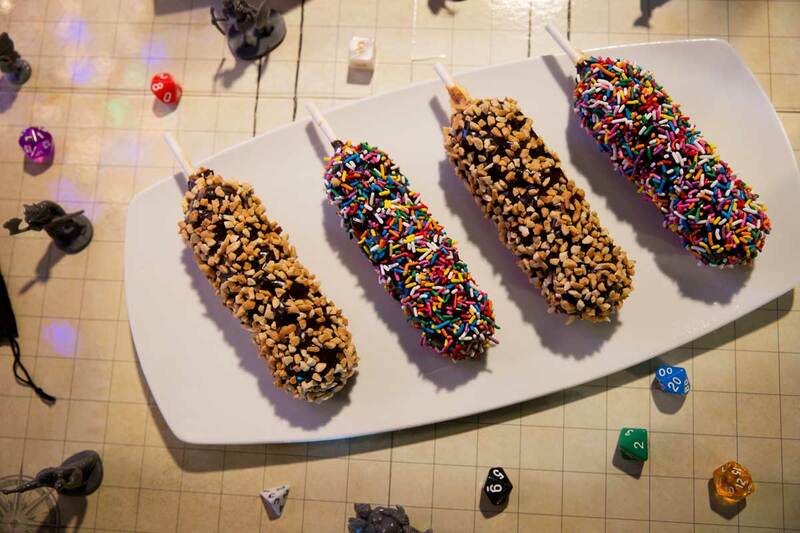 These Fudge Dipped Waffles on a Stick let you take your sweet snack on the go as you're running from Demogorgons and other creatures of the night. For the guest who loves waffles a la mode, this pocket sundae puts an Upside Down spin on the dessert. 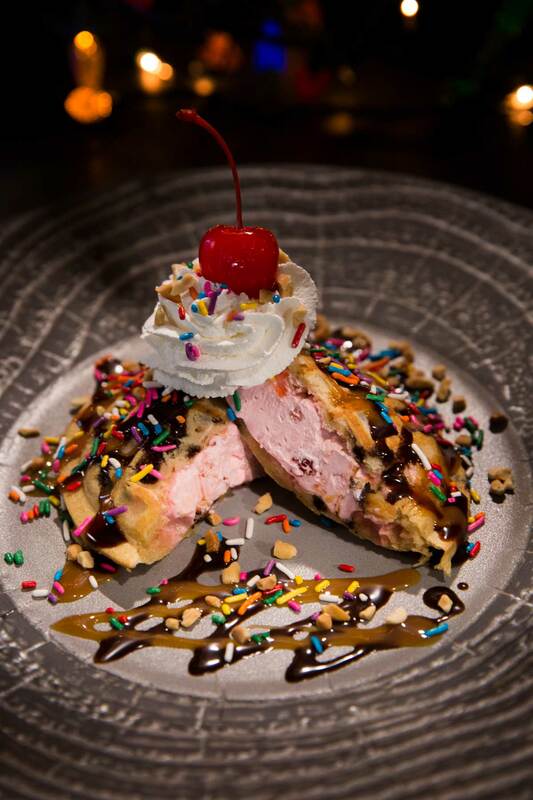 Two chocolate chip waffles are stuffed with strawberry ice cream and topped with chocolate sauce, caramel sauce, sprinkles, and whipped cream. Triple Decker Extravaganza is Universal Studios Orlando's version of the aforementioned Eleven's Waffle Extravaganza. 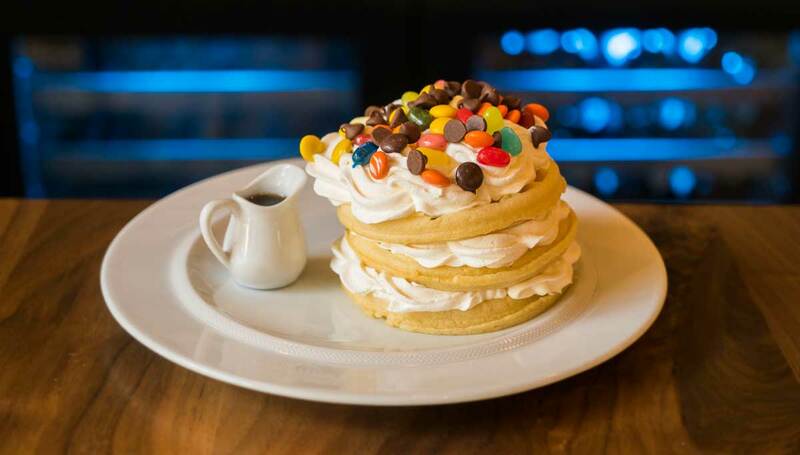 Essentially a dessert lasagna, layers of whipped cream and candy are inserted between beds of Kellogg's Eggo Waffles. It wouldn't be a Stranger Things menu without tons of waffle items. 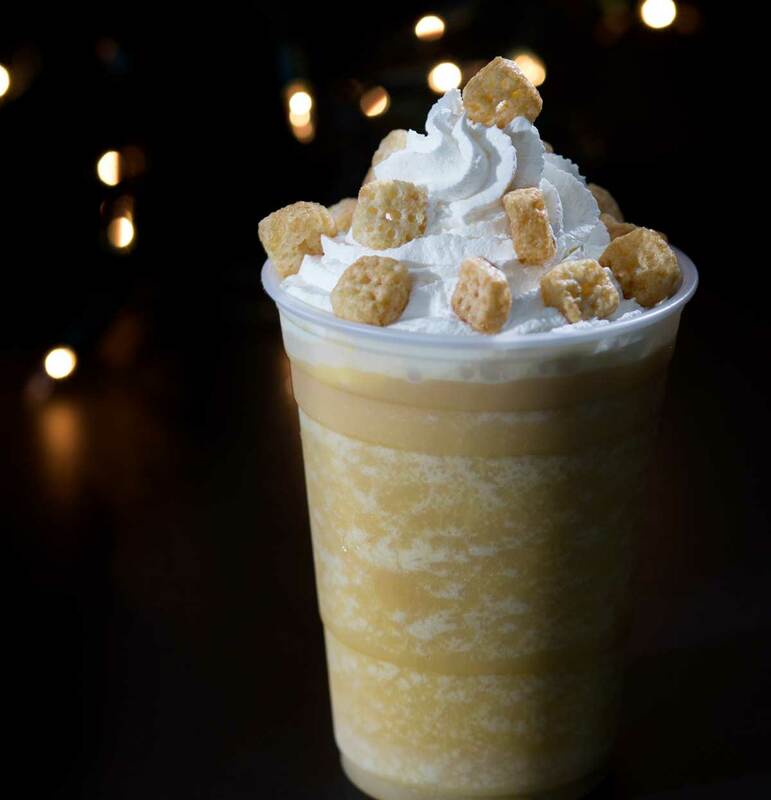 This refreshing take Eleven's favorite food features a blend of non-alcoholic syrup flavors that are topped with whipped cream and tiny waffles. Perfect to keep you cool and satisfy those maple cravings. Christmas lights played a major role in the first season of the series as a medium for Joy Byers to communicate with her missing son Will. 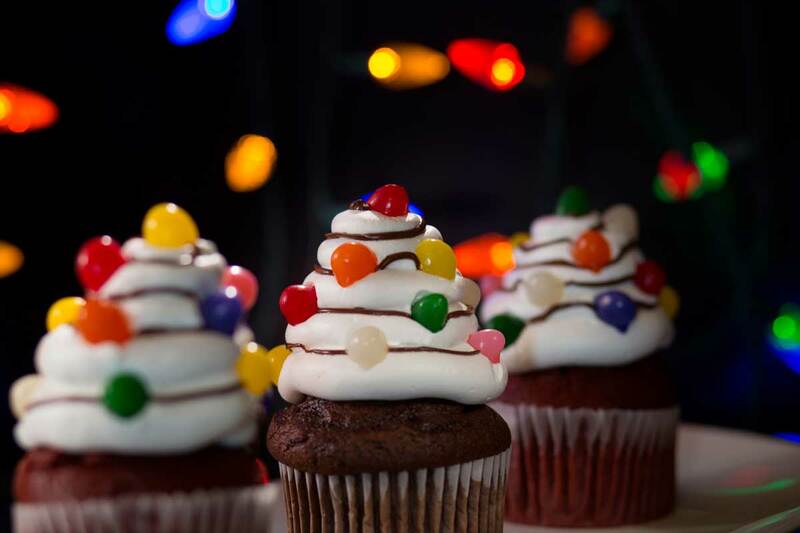 At Universal Studios Orlando, Christmas lights also play a major role in communicating with my sweet tooth in these jelly bean topped cupcakes. Eleven's telekinetic powers often led to nosebleeds the more she exerted herself. 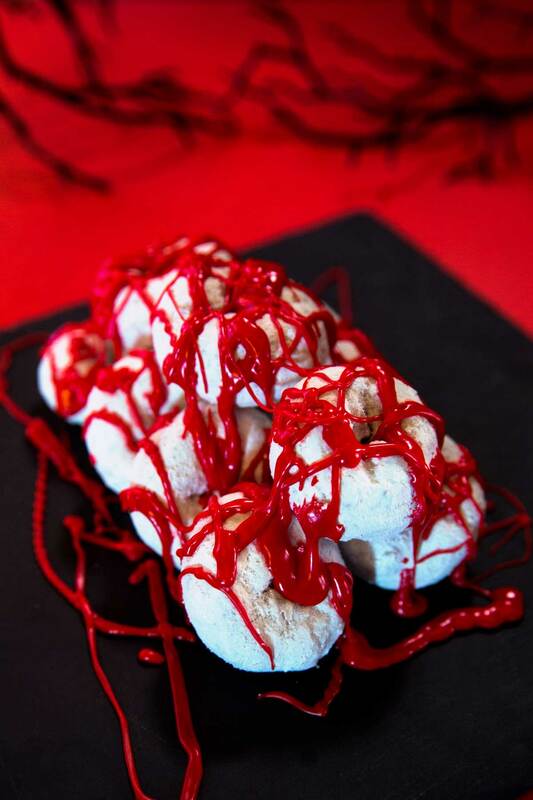 The 11 Mini Donuts are coated in powdered sugar and topped with red frosting inspired by those nosebleeds. Is it weird to want to try one — or three? Fans will remember in an early episode that fan-favorite Dustin once offered his crush Nancy Byers a slice of pizza topped with sausage and pepperoni. Guests can't go wrong with a savory slice featuring two of our favorite pizza toppings. Universal Orlando will also feature a Benny's Burgers locations where guests can sit down to a variety of burgers and chicken sandwiches.